Lesson plans. Extra-curricular activity schedules. Co-op assignments. Homeschool budgets. All those book and computer files. As a homeschool mom, it’s hard to keep it all organized. 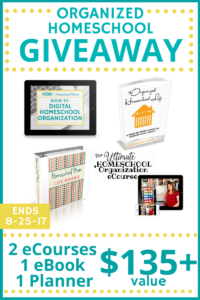 Enter the Organized Homeschool Giveaway to win four prizes that will help you bring more order to your life. With two eCourses, one ebook and one printable binder pack valued at over $135, you will learn lots of tips and tricks for creating an organized homeschool. CLICK HERE to learn more and enter. Giveaway ends August 25, 2017.